Put your hands out in front of you, palms facing together. That's how theropod dinosaurs held their hands. Now lower your hands so that they're resting on your desk, and let your fingers assume their natural curl. That's how theropod dinosaurs rested their hands on substrates! Usually, you see restorations of theropods with their hands held palm-down, like Mr. Burns on the Simpsons holds them, or the "Velociraptors" in Jurassic Park. Well, paleontologists have known for years that most theropods--at least, all the ones with preserved wrists--were simply unable to assume such a posture. Humans (and non-human primates) are able to "twist" our wrists because our radius basically moves over the ulna. Let's do an experiment. Put your arms straight out at your sides, palms facing forwards. Now, move your palms so that they face down. That's called pronation. Now, move your palms back to face fowards. That's supination. Put your arms back down to your side--that's adduction. Move them back out, and that is abduction. Now, raise your arms over your head. The movement at your shoulders is called protraction. Move them back down, and it's retraction. Okay, relax. Put your arms down to your sides. We'll do wrist exercises. Move your wrist so that the back of your hand forms a right angle to the back (hairy side) of your arm. That is hyperextension. Move it the opposite way, and it's flexion. Go back to neutral and that movement is called extension. Let's do two more: bend the wrist down so that you try to form an angle between the pinky side of your hand and your ulna. That's a tough one, right? It's called, predictably, ulnar adduction. Try bending your wrist the opposite way--that's almost impossible for humans, and it's called radial abduction. So it turns out that theropod dinosaurs couled not pronate or supinate their arms, so "twisting" the wrist was impossible. However, they were very good at flexion and hyperextension. As theropods evolved, they became better and better at ulnar adduction. 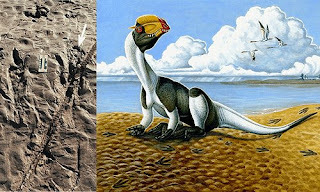 Furthermore, theropods were able to hyperextend their fingers--even early theropods like Coelophysis. The osteology of theropod hands is quite well known thanks to Carpenter's excellent work in 2002. In all, theropods in general were good at clutching things close to the chest. Let's do one more pantomime experiment to illustrate theropod arm movement. Stand up and bend over slightly, drop your arms towards the ground, and rotate your wrists so that they're facing each other. Bend at the elbow slightly, but keep your wrists straight--in line with your lower arm. Curl your fingers and hands toward your chest as if you're trying to hold something. Now, relax your fingers while moving your arms up toward your sides (movement should be restricted to your shoulders). Stop when your arms naturally assume horizontal position. That's about how a theropod moved its arms up and down. If you want, you can protract your shoulders, but only to the point where a right angle forms between your upper arm and your side--most theropods were unable to protract beyond that point. So the osteology is well-known. Theropods developed fairly avian arm joints early in their evolution. But wouldn't it be nice to see evidence of that in some other way than playing around with arm bones? Well guess what, kiddies--it's here! If theropods were able to somehow able to hold their hands palm-down, you'd think that, eventually somebody would find an ichnofossil of a theropod hand, palm-down, in line with the feet. Milner, et al. reported yesterday on a resting trace of a probable coelophysoid dinosaur with manual handprints, and they show conclusively that theropods rested their hands pinky-side down, as I described in the first paragraph! The animal is sitting on the beach of an ancient lake. It is resting on its ischial collosity, with the whole foot on the ground. There are even some tail drag marks. But most importantly, there are well-defined manual impressions, and they show claws marks pointing inward and the pinky edge of the hand against the ground. So it would seem that, even among primitive theropods, the hand was habitually carried this way. The excellent picture at the top of the post is by Heather Luterman, and I recommend checking out her site! I especially like her Ambulocetus! Milner, A. R. C., Harris, J. D., Lockley, M. G., Kirkland, J. I. & Matthews, N. A. (2009). Bird-like anatomy, posture, and behavior revealed by an Early Jurassic theropod dinosaur resting trace. PLoS ONE 4(3): published online. Carpenter, K. (2002). Forelimb biomechanics of nonavian theropod dinosaurs in predation. Senckenbergiana lethaea 82(1): 59-76. Zach -- that was hands down (ba-dum, chik!) the best explanation of the whole pronation/supination (and other motions) I've seen in...well, maybe ever! And to think, I'd been trying to explain much of the same thing a lot lately, but didn't do quite as good a job as you've done! Oh -- aside from the one she did for our paper, I think my favorite of Ky's (Heather prefers to go by Ky, from her middle name Kyoht [rhymes with "coyote" without the "ee" sound at the end]) is the Deinonychus with the sock problem...! As Jerry said, love your explanation, and to top it off, I found myself laughing all alone in my office imagining people reading you blog and doing the exercises! Actually, all of us involved at one point were email pictures of our hands on our desks figuring out how the hands were laying. Even Neffra at a bar in Ottawa (...or was it Ausin?) crouching on the floor with her hands down playing theropod. Anyway, I'm going to ask people to check out your blog for explanations of forelimb motions. Thanks, guys! Glad I could help. Thanks for this clever post, Zach. It was such a help when I was writing my one.